The inability to find really suitable baptisms for the two Launceston vintners raises questions as to the original spelling of their surname. 'Knill' seems indeed to have been the most common spelling, especially in Devon, but in the 1600s people with the surnames 'Nill', 'Nyll', 'Nile', 'Nyle', 'Nell', 'Niell', 'Nyell' and 'Neill' can be found in west-country parish registers both inside and outside Devon, particularly in Cornwall. Further spelling variations are found where an 's' was appended to such names.5 Most of these surnames would have been pronounced in a similar fashion, and one man, who lived in Maker, Cornwall, had his surname spelt four different ways in successive register entries. John 'Nells' married Elizabeth Smyth in Sheviock in 1630. This couple's three (probable) children – probable because the mother's Christian name was not recorded – were baptised in Maker in 1635, 1645 and 1646, the father's surname shown respectively as 'Nyll', 'Nyle' and 'Nile'. The eldest child (b.1635) was named George. Was it this child who became George Knill, the vintner of Launceston? The gap between the first two children is large. Did John and Elizabeth Nells/Nyll/Nyle/Nile of Maker perhaps also have a son named John, born (but not baptised) between 1635 and 1645? This was during the Civil War, when many babies were not baptized. George Knill (the first) and his wife, Susan(n)a née Warren, produced four children, all of whom were baptised at St. Mary Magdalene, Launceston, namely George (1 March 1667/8), John (22 October 1670, and buried four days later), Judith (23 July 1672, and died aged two) and John (24 October 1676). Of the two that reached adulthood more will appear below. George, the vintner himself, was buried in Launceston on 1 November 1676, his will being proved in Exeter the following year. Sadly the will was destroyed during WWII, and no copy or abstract of it has been found. George was survived by his wife, a son of nine and another son just a week old. Susanna Knill née Warren, now George Knill's widow, had been baptised at Plymouth St. Andrew on 5 February 1642/3, the daughter of William Warren and Judith née Pike.7William Warren was described as a 'vintner' in 1661 at the baptism of his youngest child, Judith. So, it is quite possible that George Knill had in fact worked for or with William Warren before marrying his daughter and setting up business in Launceston. Susanna's elder brother, John Warren, a wealthy merchant of Plymouth, died in 1703/04 leaving a will which was proved at the Prerogative Court of Canterbury (PCC). 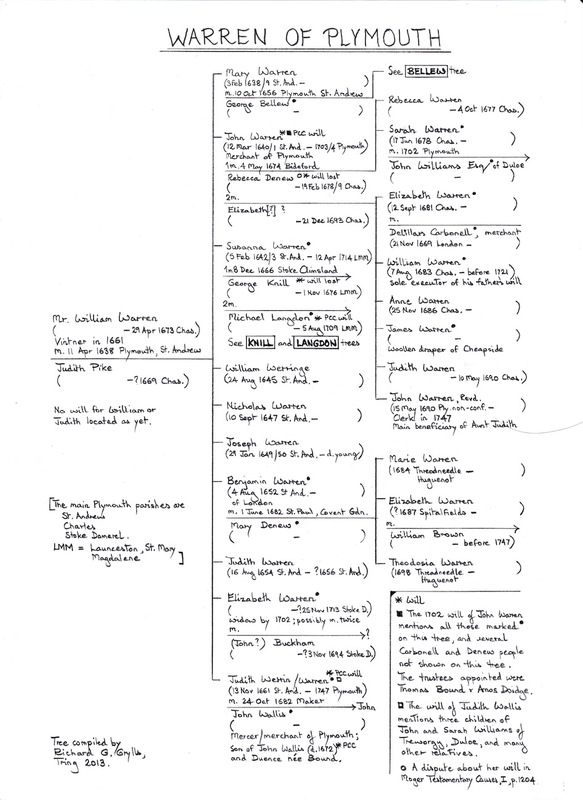 His will gave a lot of information about his surviving siblings and their spouses, as well as details of his own children by two marriages.8 A Warren family tree has been constructed using this information and findings from other sources. Among those mentioned in John Warren's 1704 will were his sister Susanna and her [second] husband, Michael Langdon, to each of whom he gave a mourning ring. John Warren also gave a mourning ring to his brother-in-law, George Bellew, who was yet another vintner in Plymouth. 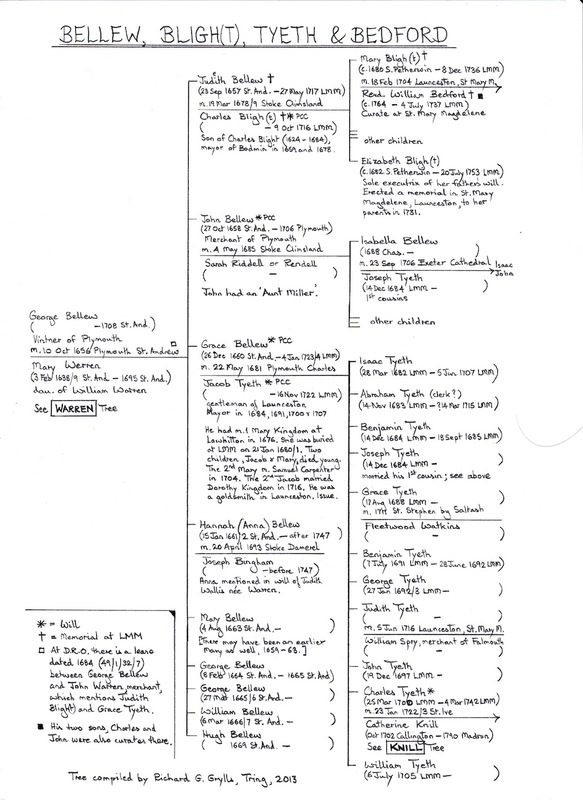 In 1656 George Bellew had married at Plymouth, St. Andrew, Mary Werren/Warren, elder sister of both John Warren and Susanna Knill née Warren, later Langdon. Judith (1657-1717) m. Charles Bligh/Blight (d.1716) in Stoke Climsland in 1678. Charles Bligh was the son of another Charles (1624-1684), twice Mayor of Bodmin. Mary, the daughter of Charles Bligh and Judith née Bellew, married Revd. William Bedford (b.c.1674-1737), curate of St. Mary Magdelene, Launceston. William Bedford and two of his sons were curates at that church successively for 73 years, 1714-1787. In 1731, another daughter of Charles and Judith Bligh, Elizabeth, erected a memorial in memory of her parents in St. Mary Magdalene, Launceston. John (1658-1706), m. Sarah Riddell at Stoke Climsland in 1685. John Bellew was a merchant in Plymouth. Among John and Sarah's children was Isabella (b.1688 Plymouth Charles), who married her first cousin Joseph Tyeth (b.1684). John left a will, proved at the Prerogative Court of Canterbury (PCC). Grace (1660-1724) m. Jacob Tyeth (d.1722) in Plymouth in 1681. Jacob was a 'gent' of Launceston, and mayor of the town four times between 1684 and 1708. Jacob and Grace Tyeth's ten or more children included Joseph Tyeth (b.1684), who married his cousin Isabella Bellew in Exeter Cathedral in 1706, and Charles (b.1700), who married a daughter of George Knill (the second) – mentioned below. It is probable that Jacob Tyeth's first marriage was to Mary Kingdon at Lawhitton in 1675. The surname Kingdon will reappear in the Langdon Family section. Both Jacob and Grace Tyeth left wills, proved at the PCC. Hannah or Anna (b.1661) m. Joseph Bingham at Stoke Damerel in 1693. Joseph Bingham was a Plymouth man. Anna was mentioned in the 1747 PCC will of Judith Wallis née Warren, younger sister of Susanna Warren who married George Knill. Mary (b.1663) ………… there may have been an earlier Mary, 1659-1663. The Plymouth/Launceston 'axis' seems to have been a strong one, mercantile relationships between people of the same trade (e.g. vintners) leading to intermarriage. It is also interesting to observe that vintners seem to have been successful enough financially for their children to marry into gentry families. Why so many of the marriages above took place in Stoke Climsland Church is not clear at all. Michael Langdon married Susanna née Warren, the widow of George Knill (the first), in about 1676. No sign of the marriage has been found in any church register or marriage index. Michael was described first as an 'apothecary' and later as a 'surgeon' of Launceston. The couple had five children, who would have been the half-siblings of the two surviving Knill boys. The baptism of Michael Langdon has not been found. From his 1709 PCC will it is known that Michael had sisters Joan (possibly the wife of a 'cousin', Humphry Langdon of Jacobstow), and Mary (the wife of Thomas Kingdon of St. Stephen by Launceston), and a brother Thomas, living in Bristol in 1709 with children (possibly by Hester née Cann). Despite not finding the baptisms of any of these four siblings, there is strong evidence that they were the children of Robert Langdon and Joane née Jeffery, who married at Exeter, St. Sidwell, in 1637. In 1676 Nicholas Jeffery, merchant of St. Stephen's by Launceston, died leaving a will, which was proved in Cornwall.9 In his will he mentioned 'my brother-in-law, Robert Langdon' and 'my kinsman Michael Langdon, his brother Thomas and their sister, Mary Kingdon'. 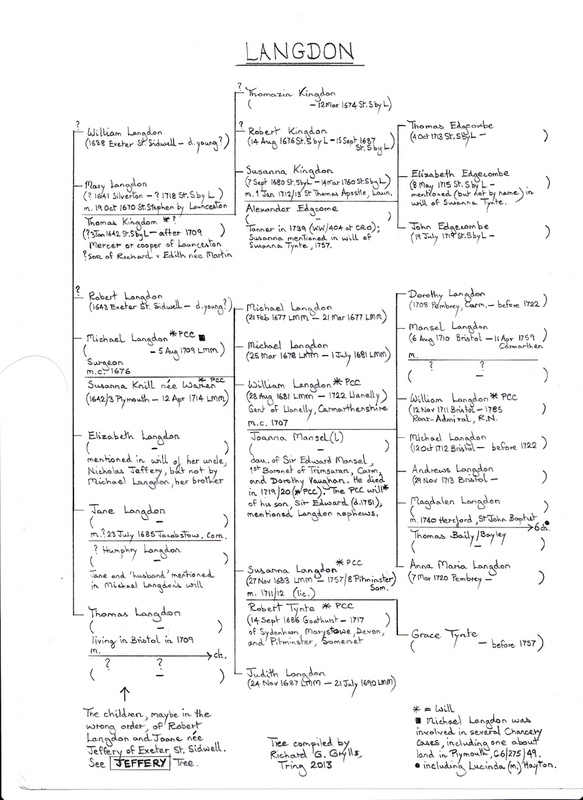 Since Michael Langdon, surgeon of Launceston, mentions the same siblings in his own will, it would seem the identification of Michael's parents is correct. The executors of Nicholas Jeffery's will were John Morth of Talland (whose son was the principal benefactor of the will) and John Facey of Werrington. In 1678 these two men initiated a chancery case (C 6/231/33 & 36, C 6/596/11) against Michael Langdon. Apparently back in the 1640s, due to the 'extravaganzy of their father' (Nicholas Jeffery's brother in law, Robert Langdon), the four Langdon children were living 'in great distress' in St. Sidwell's, Exeter, and were being supported by 'relief'. Nicholas Jeffery appears to have helped secure their future, and taken the children into his own house in Launceston, and essentially been responsible for the upbringing of Michael Langdon and his siblings. Morth and Facey accused Michael Langdon of pretending that Nicholas Jeffery was in debt to him before the latter's death in 1676, and after his death appropriating many of the possessions of the deceased. The outcome of the case is not known, but, presuming there was an element of truth to the accusations, it does not reflect well on the character of the man who had just become the stepfather of the two Knill boys. Michael Langdon seems to have spent some time in Plymouth before setting up to Launceston. In 1671 John Young junior, a 'chirugeon' of Plymouth, who was in fact the surgeon aboard a ship (possibly in the service of the East India Company), died on a voyage back to England. He was the son of another John Young of Plymouth, also a surgeon. His 1671 PCC will names a splendid amount of relations, but also includes one bequest of special significance to this paper. "Item I give to my late servant Michael Langdon twenty shillings to buy him a mourning ring." John Young was born in 1641, whereas Michael Langdon was probably born a few years later. A surgeon's 'servant' was probably an apprentice or medical assistant. At a guess, Michael Langdon received his medical training in Plymouth, working with the two John Youngs, father and son. Plymouth, for a long time a prosperous town because of trade, seems to have become a centre of training for surgeons, physicians and pharmacists, in fact for all concerned with the practice of medicine. Though the Royal Naval Hospital was not established in the town till the 1680s and the Royal Naval Dockyard not until the 1690s, there was still a strong naval presence in the town, particularly when England was at war. This contributed to the need for surgeons. In peace time, those young men who had been trained in medical practice in Plymouth looked for positions in other thriving towns nearby, whose rising middle class inhabitants liked to have medical advice near at hand. Whether Michael Langdon was the first surgeon to practise in Launceston has yet to be established. He was certainly one of the first, and seems to have been a most successful man. The two of Michael and Susanna Langdon's children who survived both married – very well. Their son, William Langdon (1681 Launceston – 1722 Llanelly), married Joanna Mansel(l), the daughter of Sir Edward Mansel, 1st Baronet of Trimsaran, Carmarthen. They had at least seven children, including a son William (1711 Bristol – 1785), who became Admiral of the White in the Royal Navy. Michael and Susanna's daughter, Susanna, married Robert Tynt(e), gentleman of Sydenham, Marystowe, Devon, and Pitminster, Somerset. Robert Tynt's father had been a baronet. At present it appears that Robert and Susanna Tynt had just one child, a daughter, Grace. More important for the purposes of this paper is the fact that Michael Langdon was stepfather to the young Knill boys, George and John. It would seem probable that John Knill (the second) learnt at least some of his surgery skills from his stepfather. The testimonial this John Knill received in 1699, whereby he was registered as a surgeon, was written and signed by Nathaniel Sprye and Michael Langdon. In his will Michael Langdon bequeathed to John Knill 'all my Shop of Druggs with all the utensills thereunto belonging and also all such Books in my Library as refer to Physick and Surgery'. How much influence Michael Langdon had on the career of his elder stepson, George Knill (the second), will be discussed shortly. 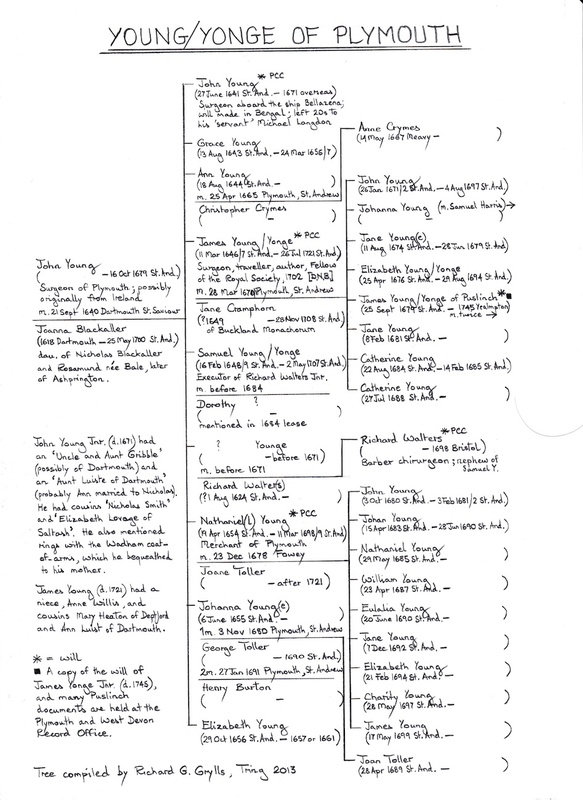 Despite not being provably related to either the Knill or Langdon families, a tree of the Young/Yonge family of Plymouth has been compiled and appears at the end of this paper. Several members of the family left wills, and it is clear that they were interesting and talented people. John Young junior, the surgeon to whom Michael Langdon had been a 'servant' and who had died overseas in 1671, had a younger brother James (1646/7-1721), a highly successful surgeon and physician, whose life and career are well documented in the Dictionary of National Biography. This James's second son, James (1679-1745), a merchant and a gentleman, was married first to Penelope Kendall of Lanlivery and then to Mary Upton, an heiress. Through his second marriage he acquired an estate named Puslinch in the parish of Yealmpton, where he built a fine house. He was the progenitor of a large and well documented clan of people spelling their surname Yonge. As was mentioned in the first section of this paper, the origins of this first John Knill remain uncertain, as does his exact relationship to George Knill (the first). This John Knill was described as vintner of Launceston at the baptisms of his two daughters, Judith and Susanna, who were born in 1679 and 1681 and baptised at Launceston, St. Mary Magdalene. John had married Elizabeth Locke at the same church in 1676/7. John Knill seems to have moved to Looe, perhaps not long after 1696 when his daughter Judith married (in Launceston) Robert Beach, later a burgess of Looe. The only evidence that John Knill had continued in the wine trade when he moved to Looe was that his widow, Elizabeth, supplied the communion wine in 1715.14 It is not clear what Robert Beach's business was, but John Knill and his son-in-law may have decided to go into business together, hence the move. Robert and Judith Beach had at least four children, only two of whom are mentioned in the will of their grandmother, Elizabeth Knill. 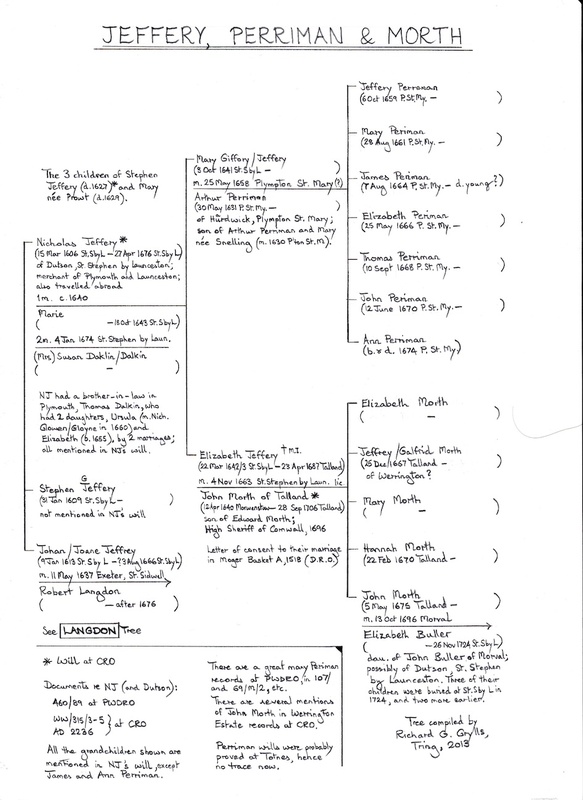 One of those children, Henry, was baptised in St. Olave, Southwark, but it was in Elizabeth's will that Robert was said to be a 'burgess of Looe', so presumably the couple had returned to Cornwall by 1722. John Knill was buried in the churchyard of St. Martin by Looe in 1712, just under ten years before his widow Elizabeth was buried there. John did not leave a will, though Elizabeth did, the will being proved in Cornwall in 1723. Whether either of the surviving Beach grandsons married and had children has not been determined – they certainly did not do so in Looe. Henry Beach's estate was administered in Looe in 1737. Before leaving this John Knill, it is worth noting the names he gave to his two daughters. The origins of his wife, Elizabeth Locke, are not known, and thus whether or not the names Judith and Susanna had been used in her family. Is it mere coincidence that Judith was the name of the mother-in-law of George Knill (the first) and Susanna was the name of George's wife? If John Knill (the first) was younger brother of George Knill (the first), then of course it could be nothing other than coincidence. But, if John was George's nephew and had essentially been brought up by his uncle, then it is not totally impossible that Judith Warren and her daughter Susanna might have been important ladies in John's life, especially if John's early years were spent in Plymouth, and if the Warrens and Knills, both being involved with the wine trade, had been acquainted with one another for a long time. George Knill (the second) was a tobacconist in Callington. It is known that apothecaries of the period sold tobacco – but did 'tobacconists' also sell medicines? Since tobacco, in addition to being a luxury item, was considered good for one's health, it is quite possible that George Knill was also an apothecary, supplying and prescribing medicines to sick people. Why he settled in Callington is unclear, save that he may have perceived the need for a tobacconist in that town. Interestingly in 1693, when he was granted a licence to marry, he was said to be 'of Plymouth', not of Callington. This begs a question or two. George was nine when his father, George Knill (the first), died in 1676, and not much older when his mother, Susanna née Warren, married Michael Langdon as her second husband. There is a strong possibility that, despite their own increasing family, Michael and Susanna Langdon were responsible for young George's upbringing, which would have been in Launceston. However, George's grandmother Warren was still alive, living in Plymouth. Did young George perhaps go to live with her instead, or with one of his uncles or married aunts in Plymouth? He may well have been apprenticed to an apothecary/tobacconist in Plymouth, because there may have been no suitable master nearer to Launceston. Or, was he perchance apprenticed to a Callington man, but then chose initially to live in Plymouth for work reasons? Neither George Knill's 1693/4 marriage to Catherine Grose15 nor her origins have been located, but a transcript of their licence to marry has survived. They had six children, George (1694-1696), George (b.1697), John (b.c.1700), Catherine (b.1702), Elizabeth (b.&d.1706) and Elizabeth (1708/9- 1709/10). Sadly, the father, George Knill (the second), died quite young, as had his father. His widow, Catherine, survived him by 54 years – she did not remarry. George left a will, proved in Cornwall. It was somewhat predictable, appointing his wife Catherine and his brother John to be trustees for his children during their minority. It seems likely that George's brother John had a major influence in guiding the career paths of two of George's children. George and Catherine's children will be mentioned in a separate section of this paper. As mentioned earlier, John Knill (the second), the second surviving son of George Knill (the first), vintner of Launceston, was registered as a surgeon in 1699. Both the testimonial John received for his medical work and his actual registration 'certificate' have survived.16 The testimonial indicated that he had already been working as a surgeon 'for some years' and 'with good success'. Since he was only 23 at the time, it is unlikely he had been practising for much more than two years, though he may well have been assisting his step-father, Michael Langdon, for longer than that. Though John had no doubt received the major part of his training from his step-father, it is highly likely that he would have spent some time training in Plymouth, possibly at the newly established Naval Hospital. The signatories on John's testimonial were Nathaniel Sprye and Michael Langdon. Was Nathaniel Sprye a surgeon too?17 By 1699 John Knill was practising his profession in Callington, a growing town of the period, whose market provided a considerable amount of food for the inhabitants of Plymouth. In a splendid book entitled Callington Doctors, the Medical History of a Cornish Town,17 Alastair Tinto – the author of the chapters about the early period – describes in 'delightful' detail the finer points of surgery of that period, and what work John Knill might have done where. Alastair was fortunate to find that, in the records of the Overseers of the Poor in the parish of St. Dominick for 1699, there is a detailed account of the treatment John Knill provided for Doll Collin, and the bill the overseers paid for this. John Knill (the second) had two nephews, George Knill (the third) and John Knill (the third), and a niece, Catherine Knill, the children of his deceased brother, George Knill (the second). As has already been mentioned, he seems to have been a strong influence on the two boys – both became surgeons, the elder in Callington, the younger in Launceston. Both these young men were no doubt trained by their uncle. John Knill in fact outlived his eldest nephew, George Knill (the third), so the main beneficiary in his will was that nephew's son, John Knill (the fourth; 1733/4-1811), a larger-than-life character to be mentioned in due course. Though obviously of no significance, it is interesting to note that all the George Knills (first, second and third) died at the age of about 40, while the John Knills (second to fourth) lived till they were over 70. Three of the children of George Knill (the second) died as infants, but, as was mentioned earlier, his two surviving sons both became surgeons. George Knill (the third; 1697-1738) was a surgeon in Callington, no doubt succeeding his uncle John. Nothing has been found of this George's sadly short career, but from his will it is known that he leased a house in Tillie Street, Callington, which may well have been where he lived. In 1733 George took on as his apprentice Shilston Calmady, the son of Francis Calmady of Shilstone and a young man of good gentry stock. Shilston's father paid George Knill £52 to take him on, which may imply that Shilston had already completed part of his apprenticeship with another master (see below). Shilston Calmady succeeded George Knill at the Callington practice. George Knill (the third) married twice. His first wife was Gertrude Pearce (1697-1722) from St. Mellion, daughter of Digory Pearce and Garthrud. Their son George (the fourth) died as an infant, but their two daughters, Gertrude (c.1720-1772)20 and Catherine (b.1722),21 both married and had families. In 1732 at Milton Abbot, George Knill (the third) married as his second wife Mary Pike, who was related to the Edgcombe family of Mount Edgumbe.22 By her George had one son, John Knill (the fourth; 1733/4-1811), who, as mentioned above, will be covered in a separate section later. George Knill (the third) died in 1738 aged 40, and his will was proved in Bodmin the same year. He had appointed his only son, John, then a child of only four, as executor. By the terms of the will George's uncle, John Knill (the second), and George's widow, Mary, were appointed joint trustees and guardians of young John (the fourth). However later in the will George Knill did 'humbly propose' that, if his wife Mary married again, then 'my Uncle John Knill will take all my Son's Effects and Estates into his care and management'. In 1748, after Uncle John's death and also the remarriage of George's widow (Mary née Pike), the administration of George Knill's 1738 will was declared null and void. A new administration was granted whereby Catherine Tyeth, George's sister, was appointed legal guardian of young John (the fourth), by then a fourteen year old. The will itself was finally proved again in 1755, when young John reached the age of twenty one. As mentioned, George's second wife, Mary née Pike, survived him, and married as her second husband Robert Jope of Callington, probably after no more than a year of widowhood. This couple will be mentioned again below. The appointment of a new and sole guardian (Catherine Tyeth) for Mary's son by her first marriage (John) may well have been appreciated by Mary, who by 1748 was busy bringing up seven children by her second marriage. The second surgeon son of George Knill (the second) was John Knill (the third; c1700-1771). He practiced in Launceston. He was described first as a pharmacist, but later as a surgeon. He was sufficiently distinguished in Launceston to be elected mayor for a year on two occasions, 1747/8 and 1762/3. Like his brother he took on apprentices, Robert Bennet and Sampson Couch in 1741 and Robert Derrant in 1745,23 the fathers of each of whom paid £84 for the privilege, rather more than had been paid by Shilston Calmady's father a mere eight years earlier. Where these three apprentices of John Knill of Launceston subsequently settled and practiced has not been determined. By his first wife, Rachel née Hearle, daughter of John and Elizabeth Hearle of Liskeard, John Knill (the third) had three children, Catherine, John Grose and George (the fifth). Their daughter Catherine Knill married John Peters from Tregony. By the 1760s he had settled in Callington and was styled 'gentleman' when he made his will, proved in 1779. He had probably practiced as an attorney in Callington. John and Catherine Peters' daughter Rachel (b.1752) married Samuel Benny (d.1838), yet another surgeon of Callington. Samuel Benny does not appear to have been born in the town, so whether he trained there is not certain. However, it is good to be able to draw a line of relationship between John Knill (the second), who officially started practising as a surgeon in Callington in 1699 to Samuel Benny who practised in Callington until not long before his death in 1838. Richard Peters, a son of John Peters and Catherine née Knill, and thus brother-in-law of Samuel Benny, was a surgeon in Launceston. About John Grose Knill (b.1729), first son of John Knill (the third), nothing is known at present. His younger brother, George Knill (the fifth; 1734-1762), was appointed Constable of Launceston Castle for the years 1760-1762.2424 He had the care and custodianship of the gaol, and had to keep the buildings in repair at his own charge. But he was given an allowance of £13-6s-8d per annum. George Knill (the fifth) died in Launceston in 1762, and by the end of 1763 John Mules had been appointed constable in his place.25 A Knill pedigree dated 1795 indicates that neither of these two brothers married or had issue. The third child of George Knill (the second) who survived into adulthood was Catherine (b.1702). In 1722/3 she married Charles Tyeth, whose relationship to the Bellew and Warren families has already been noted. Bride and groom were in fact second cousins. Their eldest daughter, Catherine (1723/4-1755? ), married William Penneck of Helston (c.1725-1760), a gentleman with land interests in Helston and possibly Exeter too, while the next daughter married yet another surgeon, Walter Borlase (1727-1797), who practised in Penzance. Whether either of the two Penneck sons entered the medical profession has not been determined, but of the five Borlase sons one, John Bingham Borlase (b.1753), followed in his father's footsteps as a surgeon. John Knill's father, George Knill (the third), died when John was only four or five. Presumably John was then brought up by his mother, Mary née Pike, and her second husband, Robert Jope of Callington. Robert Jope was patron of the borough and thus had a considerable say in who represented the Borough of Callington in Parliament. By all accounts Mary, John Knill's mother, was quite a lady, managing the borough after the death of her husband, and twice appearing as a witness before a House of Commons Committee concerning contested elections in the borough, where she made sure that young MPs treated her with the respect due to her. 'She was a very handsome woman, and retained her beauty to a great age. '27 The young John Knill no doubt had a stimulating and inspiring childhood. His role as Customs Inspector was no doubt a difficult one. As a result of his training in Penzance John Knill would have been acquainted with (or was in some cases related to) a number of the gentry families in the area. Though proof is hard to come by, there seems little doubt that the heads of several of these families (including lawyers themselves) were well supplied with smuggled goods. For John Knill, upholding the law and maintaining his friends must have been a difficult balancing act, but it seems he managed this well, becoming a very popular and philanthropic citizen of St. Ives, and mayor of the town for a year. When John Knill moved permanently to London in 1782, he maintained his affection for and contact with St. Ives in a delightfully eccentric way. A trust deed 'in the Oaken Chest in the Custom House at St. Ives, dated 29 May 1798' gives the details. (i) John Knill of St. Ives, then Grays Inn, Middlesex, esq. - annuity of £10 from manor of Glivian alias Glivian Richard, in the parish of Mawgan and all (i)'s lands there. Anuity payable to (ii) at Town Hall on 24 June at noon. (ii) to pay it to the Mayor, the collector of customs in port of St. Ives, Lecturer in the Church of St. Ives or the Vicar if resident, if not to the Curate. Annuity to be deposited by all these in a small chest of iron or oak bound with iron secured by three locks. Keys to be kept by Mayor, Collector of the Customs and Lecturer (or Vicar or Curate). Chest to be paid for from annuity and to be in the custody of the Mayor. Half of annuity for repair and support of a mausoleum erected in 1782 by John Knill on Worwas Hill in Worwas in Lelant on land bought of Henry Lord Arundel of Wardour and for providing new lightening conductor. Other half of annuity to be saved for five years to make £25. On 25 July (Feast of St. James the Apostle) every sixth year £10 of this £25 to be laid out for a dinner for the Mayor, Collector of Customs, Lecturer etc. and no more than six guests at some tavern or public house in the borough. £15 residue to be distributed as follows. £5 to be given to ten girls of St. Ives each over 10 and daughters of seamen, fishermen or tinners who between 10 a.m. and noon on 25 July are to dance 'for the space of one quarter of an hour at least' on the ground adjoining the Mausoleum and after the dance 'sing the hundreth Psalm of the Old Version to the fine old tune to which the same is now sung in the Church of St. Ives'. Each girl to receive 10 shillings. £1 to be given to a fiddler to play for the dancing and singing and to play before the girls on their return to the borough. £2 to be given to 2 widows of seamen, fishmen or tinners of the borough of St. Ives of 64 years or upwards 'who shall attend the dancing and singing of the said ten girls and shall certify to the Mayor Collector of the Customs and Lecturer (or Vicar or Curate) for the time being that the same have been performed in the manner and form herein before directed or prescribed and who shall also walk before the said girls on their return into the said borough immediately after the said fiddler'. The sum of £1 to be laid out in purchase of white ribbons for favours or breast knots for the ten girls and two widows and for a cockade for the fiddler to be worn on 25 July and the Sunday following £1 for purchase 'of a book of the best folio Letter Paper bound in vellum' for entering the proceeding of five of the Quinquennial Feasts... 'every such Book to be of uniform size and binding marked with its proper number and to be kept and preserved as clean as may be in the Chest ..'. £1 to clerk or writer (who shall be the Clerk to the Collector of Customs) to enter up the proceeding in the book. Remainder of £5 to be paid to man and his wife (or widower or widow) being of 60 years or more, the man being an inhabitant, of the borough and having been a seaman, fisherman, tinner or labourer who without any assistant from the poor rate shall have bred up to ten years the greatest number of legitimate children. If Feast of St. James fell on a Sunday dinner etc. to take place on Monday following. If £100 accumulated £50 always to remain for repair of Mausoleum. £10 (when £100 accumulated) to be paid to such a woman being a native of St. Ives who shall have married seaman, fisherman, tinner or labourer (an inhabitant of St. Ives) between previous 31st December and 26th is not over 36 or under 20, who is most worthy and deserving 'particular regard being had in the choice or selection of such woman to her duty and kindness to her parents or to the relations or friends who shall have brought her up'. (Mayor, Collector, Lecturer etc. or two of them to decide. £5 when £100 accumulated) to such woman of any age single or married, being an inhabitant of St. Ives as shall be judged by Mayor, Collector Lecturer etc. or two of them 'be the best knitter of Dungarvon or any other kind of fishing net used for the taking of pilchards or any other kind of fish' for the time being be most encouraged by counties from the legislature'. £5 to woman judged (as before) to be best packer and curer for exportation of pilchards or other fish encourated etc. £5 to two boys who in fishing season before 25 July shall row in a 'boat called the Follower which attends every boat which carries a seine or a large net employed in the taking of pilchards and other fish as shall be judged (as before) to be the most worthy and deserving thereof'. £25 residue to be distributed among Friendly Societies existing in St. Ives in equal shares. If there is not one such society money to be distributed to ten poor persons, five men and five women aged 64 or more not in receipt of assistance from the poor rate." John Knill (the fourth) was himself present the first time his festival was held, and the festival has been held every five years since then. Despite the obelisk on Worwas Hill being built for use as his mausoleum, John Knill was not buried there, but in St. Andrew, Holborn, London. The obelisk itself proved a very useful landmark for mariners to navigate by, though some historians have suggested that it would have also proved useful as a signalling station for smuggling operations. The present author, having failed to find the origins of George Knill (the first) and John Knill (the first) of Launceston, is in no position to pass any judgement on whether the Knills in this paper could have been related to the noble family in Hereford. The likelihood, however, seems very low, especially in view of the quantity of people with the surname Knill (plus spelling variants) who were to be found in Devon and Cornwall in the 1500s and 1600s. John Knill (the fourth) remained a bachelor. By 1795 (by which time he had retired) he was a rich and propertied man. He had inherited land and property from his great-uncle John Knill (the second), from his father,34 and quite possibly also through his mother and her family. At least one aunt had left estates to him as well.35 As he reached old age, both he and his relatives seem to have become interested in who was his rightful heir. Theoretically at that time all his estates would go to his closest male heir ……. but who was that? John Knill (the fourth) had two half-sisters by his father's first marriage, both long dead, but one offspring of his half-sister Gertrude (who had married John Facey), namely William Facey of Colmans, Werrington, had married and did have children. John Knill had more half-siblings through his mother's second marriage to Robert Jope, including one half-brother, John Jope. At least four of his Jope half-siblings married and had children. In addition, though most (if not all) of John Knill's first cousins (children of siblings of his father, George Knill the third) were dead, several of their children had married and had children of their own. Did the descendants of these first cousins have any claim to the estates due to their equal relationship to John Knill (the second), the original owner of many of the estates, or was there a definite, provable heir, who should inherit all the property John Knill (the fourth) held? In 1795 'Mr Kitson' was requested to give a legal opinion as to the right heir. His opinion has not survived, but pedigrees drawn up at that time have.36 It appears that one tree was that which was submitted to Mr Kitson as evidence, but that he looked further into the matter and had recorded a great number more collateral descendants on a much more detailed pedigree, the other tree. It does not seem that there was any actual dispute or court case about the rightful heir, so it may in fact have been John Knill (the fourth) himself who requested help sorting out the matter. On the 'earlier' tree he is shown as 'The Devisee', and a note on the tree indicates that Mr Kitson had been delivering his opinion concerning the title to Tregonnet, South Hill. The other tree includes a note saying that the opinion was 'on title of heir at law'. Exactly who inherited what property has not been precisely determined, though William Facey certainly inherited the Knill property at Trevigro, South Hill, as is apparent in both John Knill's will and a subsequent lease of the property.37 It would seem that the Revd. John Jope of St. Cleer (1752-1844) inherited most of the remaining property, probably because he was a half-brother of John Knill (the fourth). At that date male relatives still took precedence over female ones however much more senior those female relatives were. Back in 1777 John Knill (the fourth) was painted by the young John Opie (1761-1807), celebrated Cornish painter. For reasons that are not clear Opie only finished the sitter's face. In 1808 the upper torso and hands were completed by a Mr Acres in London.38 This hybrid portrait was inherited by John Knill's half-brother, the Revd. John Jope, and by 1878 had passed to that man's grandson, John Jope Rogers of Penrose near Helston. The portrait may well still be at Penrose. No portraits of any of the other people mentioned in the text above have been located. John Knill (the fourth) died in London in 1811. His will was huge, and he left legacies to a whole host of relatives.40 Death Duty registers (IR 26 at TNA) indicate that his movable estate was valued at £17,119,41 a considerable sum indeed. The present day equivalent would probably be well over a million pounds. His executor and residuary legatee was the Revd. John Jope. Besides the obelisk and empty mausoleum on Worwas Hill, St. Ives, one other artifact connected with John Knill survives – a bottle, the one that appears on the front cover of this paper.42 It is sad that this branch of the Knill Clan died out in the male line with the death of John Knill (the fourth) in 1811, but pleasing that the branch ended with such a colourful character. Sheila Lightbody of Callington, Alastair Tinto of Cleave, St. Dominick, Christopher Knight of Chiswick, Neville Cusworth of East Sheen, Caroline Vulliamy of Luckett, Kate Geall of Trevigro, Elizabeth Bickerstaffe of Lytham St. Anne's (a descendant of John Knill Kinsman R.N. ), the staff at the Cornwall Record Office, Truro, the Cornwall Centre, Redruth, and the Westcountry Studies Library, Exeter. Moger Basket A, no. 1523, at the Devon Record Office [DRO], Exeter. The letter included the words "There is consent of parents and no impediment". Quite why the Knill/Warren marriage took place in Stoke Climsland is not at all clear. John Knill m. Thomazine Downe at Exeter St. Paul on 8 Feb 1624, and had at least six children in Berrynarbor. The only brothers named George and John Knill found so far were baptised in Georgeham, sons of Lawrence Knill, but John was born in 1644 and George in 1649, the latter too late, probably, to have married in 1666. Dr. Oliver Padel considers that the final 'e' did not in that period elongate the main vowel sound, and the addition of a final 's' did not usually alter the potential root of a name. He suggested that the name 'Neal' was probably pronounced 'Nail' and should not to be included in the group above, and that those surnames with two vowels in the middle might have been sounded with a diphthong, rather than with a single 'ill' sound. Several Chancery documents dated 1650-1700 were inspected in the hope of finding clues as to their origins. The documents are listed at the end of this paper. Several PCC wills of people living in the 1600s called Knill were also inspected without success. They lived in Braunton (two incorrectly indexed as Bampton or Brampton) or Barnstaple. 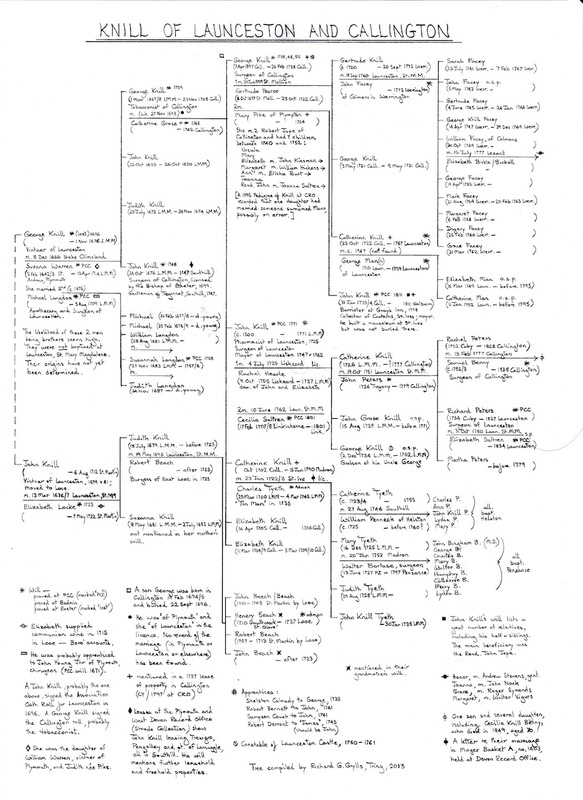 It has not proved possible to find the connection (if any) between Judith Pike and Mary Pike (see footnote 22). A court case arose after the death of his first wife, Rebecca née Denew, who he had married in Bideford in 1674. The case was heard at the Consistory Court in Exeter in 1679 and concerned Rebecca's will. The details of the case are abstracted in Moger's Testamentary Causes, Series 1, pp. 979 and 1204 and following. No marriage found; Marie, his wife, died in 1643. For reasons not yet determined, Thomas Perriman, presumably the eldest surviving son of Arthur Periman and Marie née Jeffery, decided in 1699 to mortgage all his Devon properties, including Hardwick, to James Warren (son of John Warren, merchant of Plymouth), Michael Langdon (James Warren's uncle) and after Michael Langdon's death to Susanna Tynte, his daughter. In 1721 the sale of Hardwick to George Parker caused a great many problems, due to the fact that the property was mortgaged. A large number of papers relating to these transactions and other Periman/Perriman affairs are to be found at the Plymouth and West Devon Record Office (PWDRO), in several different document series. A letter of consent dated 1663 to the Diocesan authorities from both sets of parents can be found at DRO in Moger Basket A, no. 1518. There are a large number of mentions of John Morth, father and son, in the Werrington Estate Records at CRO. In one tree at the Cornwall Record Office her surname is shown as Le Grose. A Nathaniel Spry married in Plymouth in 1677, but may have settled in Whitchurch. A Launceston Charity School was mentioned in the 1709 will of Michael Langdon. Gertrude married in 1740 John Facey of Werrington, no doubt a descendant of the man who had taken Michael Langdon to court in 1678. Catherine married George Man(n) on Launceston. Mary Pike (b.c.1711) was the fourth child of Ralph Pike of Lanteglos by Camelford, yarn buyer, and Mary née Edgcombe. Mary Pike's paternal grandparents were Ralph Pike (senior) and Philippa née Wade of Lanteglos, while her maternal grandparents were Richard Edgcombe of Edgcumbe in Milton Abbot and Prothesia née Cudlipp. The records show that his master at Launceston was 'James' Knill – no doubt an error. One could assume that it was an honour to be appointed constable of Launceston Castle. However, rather as many Sheriffs of Cornwall found, despite the privileges they enjoyed during their tenure, the expenses of office usually far exceeded the allowances. Launceston Borough records at CRO. Cecilia's older sister, Mary, married a member of the Grills Clan, Sampson of Southill, in 1734. Details about Mary Jope from The Knill Festival, a biographical sketch of John Knill, Esq. 1724-1881 by J.J.R. – copy at the Society of Genealogists, and also available online. From History of Cornwall, Volume II, pp.266-268, Davies Gilbert. The Knill Festival by J.J.R. No copy of his original essay have yet been located. CA/B42/67 at the Cornwall Record Office; also T/1894 & 5, CA/B42/66 and CA/B46/99. P91/25/1 at the Cornwall Record Office, accompanied by a note saying that the copy had been compared to the original deed on 7 October 1846 by the Revd. A. Ellis, M.A.., one of the trustees. The Revd. Ellis was the parson of St. Ives at the time. In 1729 George Knill (the third) bought property at Trevigro, South Hill, from James Hays, to whom the property had be mortgaged in 1724 by John Lugger, both being 'gentlemen of Southill'. Both trees are at CRO and bear the reference number, RP/4/34. RD/1606 at CRO, dated 1823, the surname shown as Facy. An 'aside' comment in this video suggests that John Knill (the fourth) may have had an illegitimate child or two. No evidence of this has emerged, and no legatees in his will suggest that sort of relationship. Proved at PCC. Among his beneficiaries was his nephew, Lt. John Knill Kinsman, R.N. (a son of his half-sister, Elizabeth Jope, who had married John Kinsman). J.K.Kinsman had a distinguished naval career, retiring as a commander, and dying in Plymouth in 1831. It would appear that death duties in 1811 were charged at a rate of about 3%. No total amount of tax is shown in the IR 26 record concerning his estate, though an approximate total for the various sums of duty paid is £520. One memento of John Knill's time as a customs inspector at St. Ives is a green glass bottle viewable at Royal Cornwall Museum in Truro. It shows clearly 'J. Knill, 1781' on its side. The more wealthy members of society at that time had their own bottles, which they sent to a vintner to be filled, recycling them once they'd drunk the contents.